Double-Click on any bookmark and you will be presented with the Edit Bookmark area. Here is what it looks like . . . Editing a single bookmark is straight forward. Make your changes and click the Save button. You can also delete the bookmark with the Delete button. Getting back to your bookmarks is done by clicking a Tab, the Back to Bookmarks link, the Cancel button or the Save button. If you use your browser's Back button to get back, you may not get back to your bookmarks, since Double-Click bookmark editing is done without leaving the bookmarks page you were on. So remember, click a Tab, the Back to Bookmarks link, the Cancel button or the Save button. The Edit Tab page is where you can edit all the bookmarks and headings for a tab. You select which tab to edit by clicking the tab name on your Bookmarks page. Then click the 'Edit' link to the right of your tab names. You will be taken to the Edit Tab page with the highlighted tab ready for editing. Edit uses a multi-line text box to make it easy to copy and paste groups of bookmarks and headings within a tab, and between tabs. The headings are left justified, and the bookmarks are indented by a few spaces. The text spacing helps in viewing your bookmarks and headings while editing, but you don't have to line everything up. We'll do that for you when you save the tab. Each line in the editing area is either a blank line, a heading line, or a bookmark line. The bookmarks are always a name, followed by a space, followed by a web address, also known as URL (Uniform Resource Locator). The Web Address / URL must start with http:// or https://. 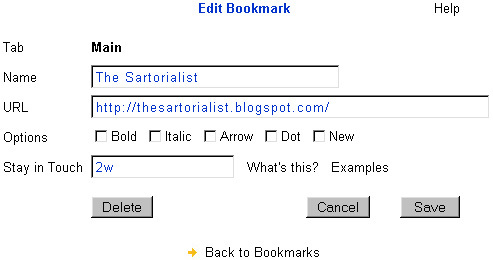 Example view of the editing area for a tab's bookmarks. Adding a Bookmark -- Visit a web site and copy the web address from your browser's web address (URL) field, click your home page icon to get to Ablemarks, click the tab you want it on, click the 'Edit' link, scroll to where you want it placed, type in the bookmark name, a space, and then paste the URL. Click Save button when done. See Adding Bookmarks help page for the fastest way to add a bookmark. Moving a Group of Bookmarks on Same Tab -- Select a group of bookmark lines with cursor, cut, scroll to where you want bookmarks placed, and then paste. Click Save button when done. Moving a Group of Bookmarks to Another Tab -- Select a group of bookmark lines with cursor, cut, click the Save button, click a tab, click 'Edit' link, scroll to where you want bookmarks placed, and then paste. Click Save button. when done. Sorting a Group of Bookmarks -- Select a group of bookmark lines with cursor, click 'Sort' link. Click Save button when done. Undoing Mistakes -- Click 'Undo' link to reverse the last Sort, Auto-Complete or edits since entering the tab. Use browser's Back button to ignore all editing of the tab. Name of your Tab. Can not be blank, and must be no more then 20 characters. Public option setting for tab. Check this to make the tab public. See the Public Tabs help page. Auto Complete - Completes bookmark lines for you. Select one or more lines with cursor and click this link. Make sure you select all of the lines. If there is only a name on a line, a URL will be added. If there is only a UR found, a name will be added. If there is a name and URL found, they will be cleaned up. For example the 'Auto Complete' link will convert this . . . 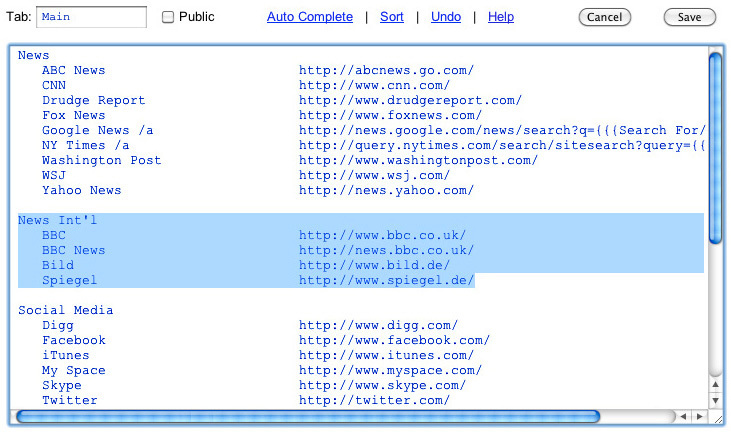 The Auto Complete feature is automatically performed on all lines that contain only a URL, when the tab is saved. This is done to give bookmarks without a name, a name. Sort - Sorts a group of highlighted lines into alphabetical order. Great for ordering bookmarks under a heading. Undo - Reverses the last Sort, Auto-Complete, or your edits since entering the tab. Only one level of undo. Enter and edit your bookmarks and headings, one per line. A bookmark consists of a name, followed by a space, followed by a URL. The URL must start with http:// or https:// . . .
A heading is a line that does not have a URL on it . . .
Use blank lines to add white space between bookmarks and headings. You can add highlighting options to your bookmarks and headings, and you can include variables in the URL's. See the Bookmark Highlights or Bookmark Variables help pages. Place highlighting options after a heading or bookmark name. Heading options are: /i /n /t. Bookmark options are: /b /i /d /a /n. These options are not checked for validity. They are used as an option if they are correct, and if not recognized, they are assumed to be part of the heading or bookmark name. This means you can still have a heading or bookmark name like "Cats / Dogs". See the Bookmark Highlights help page.